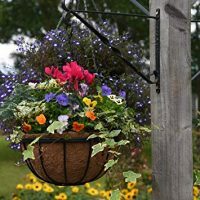 Use baskets to display spots of color around your home and garden. Looking for some fun and creative ways to display a lot of color in a little space? Hanging gardens give you the chance to put color right where you want it, plus spotlight certain plants. With the wide variety of baskets available, including wire, woven and wood, the possibilities are endless. The most important consideration in choosing a basket is the expanding root systems of the plants you’ve selected. For larger plants with deeper roots, a bigger basket with more depth would be more suitable. The more surface area for soil you have, the less frequently you will have to water and the more moisture the soil will hold. If you’re wondering how a wire basket can hold soil and plants, you’ll want to know about liners; there are many types of liners that you can buy that enclose the contents nicely. Erick prefers moss because it looks great and offers the best drainage no matter how finicky the plant. “In nature a certain number of plants grow on the sides of trees and rocks, and they need perfect drainage,” Erick says. A moss basket provides the perfect conditions for plants like the tropical vireya rhododendron, which is native to Australia. Orchids also make great moss basket subjects. Other plants like the staghorn fern and even anthuriums also work well in moss-lined baskets. Once you’ve chosen a basket, lining material, location and plants that thrive in the chosen location, you’re ready for the fun part – planting your dandy dangler. Among the latest trends isn’t so much bloom color but colorful foliage. “One thing that’s really neat is chartreuse with deep burgundy-purple,” says Erick. Although you buy moss dry, it needs to be thoroughly soaked in water to create a basket liner. Tightly pack small sections of moss between the top two wires along the top of the basket. Lay larger sheets of moss along the sides of the basket and pack them into the wire. The moss sheeting doesn’t have to be too thick, just thick enough to provide a solid netting to hold in the soil and plants. Once the fertilizer is mixed in, it’s planting time. Erick likes to create three layers: low, medium and high. For the low layer, he suggests using Lysimachia foliage to cascade over the basket edge. To conserve space, he says to carefully pack the plants into the outer rim. Next, he suggests adding lobelia, an annual with vivid purple blooms. The next layer adds height, so Erick suggests using Barleria for the center (but we might substitute a nice Angel Wing Begonia). He says to leave just enough space around it for the medium layer, which features plants that grow taller than the low-growing plants, but lower than the tallest plants. Add coleus and Heuchera on either side of the Barleria, and sprinkle soil into any empty areas left in the basket. Finally, give the basket a comprehensive watering. Erick suggests watering thoroughly, while still allowing the basket to dry out a little between watering. Before hanging, make sure the basket chain is hanging from a sturdy hook that’s rated for the weight of the pot and is anchored in solid wood. Erick warns that a wet basket weighs a lot more than a dry basket, so make sure the structure the basket hangs from is strong enough to support a full, wet basket. To help keep the basket nutrient-rich, add an organic fertilizer every four months or so. “Keep in mind that annuals like lobelia may need to be replaced, but as the rest of the plants grow, they’ll fill in the holes nicely,” says Paul. If you want to know when to water your moss-lined basket, give it a gentle tap on the bottom. If the moss feels moist, it doesn’t require additional watering, but if it’s dry and crispy, it needs a good soaking.